My Mom used to call me “The Little Pea Picker”. One of my most vivid memories from childhood is running out of my family’s home and heading straight for the garden! My Mom and Dad took pride in building a larger than life garden that had every color of the rainbow in it… talk about phytonutrients (that’s the best part of veggies that helps prevent various diseases)! The first place I always ran was the peas!! They were sweet, crunchy… I could eat them until they came out of my ears!! It was a simple formula. Eat something I loved. Feel good. Repeat. As we get older the formula for what we put into our body becomes so much more complicated. We are bombarded with so many messages about what to eat or what not to eat that we stop listening to what our bodies need. We stop listening to our gut. 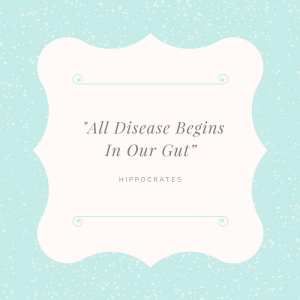 Hippocrates once said “All Disease Begins In Our Gut”. Now new research is showing that he was right! In fact, studies prove a real connection between our gut and our overall health. Everything from our immunity, to brain health, and metabolism depends heavily on the diverse population of bacteria in our gut! Yes, bacteria. The gut microbiome (or gut flora) is made up of over 100 trillion bacteria that protect us every moment of every day! Did you know that 80% of your immune system is actually IN your gut? A healthy gut microbiome helps you digest your food more easily while absorbing nutrients and eliminating toxins. When we have an “imbalance” it can lead to inflammation and disease, bloating, or skin issues like acne, among other things. 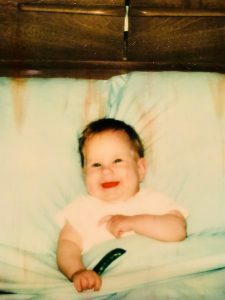 Chances are if you don’t feel good you don’t sleep well and as we all know a lack of sleep can impact other things like happiness and productivity. See how deep the connection goes? That means in order to thrive, we need to cultivate the right kinds of bacteria. Think of it like creating our own larger than life garden on the inside of our bodies. To do that we need both probiotics (bacterial strains) and prebiotics (the food that feeds the probiotics). Here are some of the best “Good for Your Gut” foods to add to your grocery shopping list. You also want to make sure you include healing herbs and spices that help calm any inflammation that may begin in the gut. Here are some of my favorites. These foods and spices will keep ‘weeds’ from growing in your body’s garden and optimize gut health. Don’t let the noise drown out what your gut is trying to tell you. I’m sure at some point in your life someone has told you to “go with your gut” when trying to make a tough decision. Think about what a difference it could make if you applied that philosophy to your health. I mean, those peas never once made my belly hurt no matter how many of them I ate! Turns out you really do need to go with your gut, fueling your body with the foods that will help you both look and feel great.